About — Southeastern Indiana Musicians Association Inc. In 2001 SEIMA was founded by Ken Jackson and eight other local musicians, Nelson Elliot, Bob Hudson, Bob Bischoff, Stafford Ripley, Clifford “Dutch” Hoffmeier, Bob Linkmeyer, Carolyn Leming and George Smith, as a way to honor the local music makers by inducting them into the Southeastern Indiana Musicians Association Hall of Fame. Since then the organization, who originally had a public exhibit space donated to them by the Dearborn Highlands Arts Council on Walnut Street in Lawrenceburg has inducted many musicians from the represented counties. Through growing pains the organization no longer has a public place of exhibit for its inductees but still presents its yearly acknowledgements of induction to local musicians and their families, at an an awards presentation that until 2018 has occurred at the Aurora Farmers Fair. Looking into the future we are committed to establishing a permanent home for our exhibits to document our community's rich and plentiful music history that has impacted not only local residents but fans of music nationwide and abroad. Each year our board made up mostly of local musicians, reviews public submissions nominating individuals deserving recognition for their musical accomplishments and contributions to the community, for induction into the Southeastern Indiana Musicians Association "Hall of Fame." Since 2001 we have recognized 133 of these individuals to date by presenting them or their family with a plaque acknowledging this contribution to the community. Duplicate plaques are created to one day be exhibited publicly by the organization. The Southeastern Indiana Musicians Association is also committed to the purposes of promoting music awareness, music appreciation and music education. Future goals include; reestablishing a permanent home for the Hall of Fame exhibits to be publicly displayed, making contributions to school music programs and music scholarships, creating music business, and production mentoring programs for aspiring musicians, as well as sponsoring and hosting local music events to raise money for the cause and general purpose of promoting live local music. Caz has been the President of the Southeastern Indiana Musicians Association for the past three years. He was the previous Vice-President before founder Kenny Jackson retired from the organization. Caz's family is deeply rooted with music; especially Gospel. His father, grandfather, and uncles are members of the SEIMA Hall of Fame. Caz is perhaps best known for being The Morning Show host and Program Director for Country 103.9 WRBI-Batesville in which he is honored to spread the word about and promote the local music scene in Southeastern Indiana. He also likes to play some of local music on the show when the opportunity arrives. Randall Garrett is a lifetime resident of Southeastern IN. He aspired to be a musician since he was 5 years old. He attentively watched the musicians at church and carried their equipment for them but never had an instrument of his own. On his 14th birthday he received $35 which he quickly took to the nearest flea market and after some haggling, bought an old Harmony electric guitar and amplifier. He practiced tirelessly and at the age of 15, he joined his first band, a local southern gospel band called the New Generation. Since then he has continued performing primarily Southern Gospel music both locally and throughout the Southeastern United States. He also volunteered his time for several years with the Milan High School Show Choir performing oldies, classic rock, country and show-tunes. He has been a promoter of Christian music and was the founder and host of a monthly music venue in Lawrenceburg called "Singin' Time in Indiana" for 3 years. 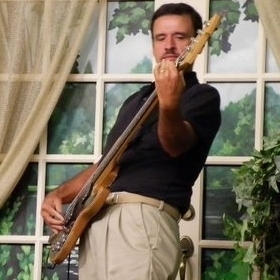 He has played for numerous Christian bands and is currently the bass guitarist for a Southern Gospel quartet called the Travelaires, a position he has held since 1990. Andy Jackson is son of SEIMA founder Ken Jackson. He is a guitarist and singer who started singing in grade school in the St. Mary's church choir as well as in the Aurora High School Choir. He began playing guitar at age 16 and continues to perform and entertain folks in southeastern Indiana. Andy not only regularly donates his time to the organization but also the community at large with performances at nursing homes and Adult centers in Ripley, Ohio and Switzerland counties. He also has performed at local festivals, fairs, and numerous community events including the Aurora Farmers Fair and Lawrenceburg Arts Alive Festival. His passion for music, family and community are truly an asset to the organization. President and head of marketing for locally based Sol Records, home of Pure Grain, Dallas Moore, Craig Gerdes, Mudbone and many others. He has spent the last 30 years in the Independent music scene both as a drummer and a producer as well as running an Independent record label since 1991. Brian records and produces primarily in the Americana and Adult Album Alternative genres and has released several Top 40 Americana, AAA and #1 video singles including Pure Grain “Truckin Song”, “Back in the Woods”, and “Cowgirl”; Dallas Moore – “Crazy Again”, “Texas Tornado”, “Beats All I’ve Ever Seen” and “Blessed Be the Bad Ones.” He studied musical performance and audio production at Berklee College of Music in Boston, MA and is a Berklee Certified Music Business Professional and Specialist in Direct to Fan and Online Marketing. Brian is a lifelong resident of Dearborn County and has been performing professionally since age 14. Singer, songwriter, guitarist, and brass! Brian aka Biggin Noble formed the band The Renegades in 1995. Brian started his love of music playing trumpet at a young age under the direction of East Central Band leaders Charles Green and Kenzie Bentle. It wasn’t until a few years after leaving high school that he began singing around campfires and learning the local music scene. In 1995 when the band The Renegades was formed he took on the roll of fronting the band singing and playing, which he truly loved. Biggin also began his solo acoustic act performing for smaller venues for the close and personal style which has went over great performing several nights a week. Sharing the stage with many folks in the Ohio, Kentucky, Florida, South Carolina, Tennessee, and Indiana music scene Biggin and The Renegades became very popular for their great lineup of such talented musicians in which Biggin was able to keep over all these years and the professionalism that he and the band showed in the industry. Eddie "Chopper" Johnson inherited a love of music from his parents. As a child, family vacations often involved music festivals and camping with friends. While he still enjoys playing around the fire, he has also spent the last 15 years playing on local stages. Past bands he has played with include Union Label and Jodi & the Creecher. He currently plays with an acoustic band called Hippie Fingers and a full band called Vague Traces. He is a vocalist and plays rhythm guitar and harmonica for both bands. Singer songwriter who played his first gig for pay at age 13. From 1970 to 1974 Deno played locally with the group Chestnut Station. Then from 1975 to 1980 he performed with Calico Rose and the Coryville Cowboys who performed shows with country acts including George Jones, Asleep at the Wheel, and Jerry Jeff Walker, Dean had a cut on the WEBN album project, and later sold that song and some others in Nashville. He also appeared on a PBS performance of WEBN’s Rock Around the Block with a studio band called Jinx in 1980. From 1981 to 1997 Dean performed with a top area dance band called The City Limits. He currently runs a recording studio and performs with the band Matrix, as well as acoustically with other local musicians in the area.